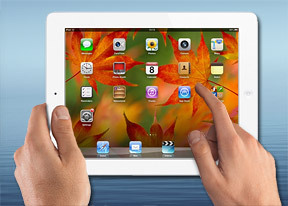 The iPad 4 is powered by the most powerful chipset Apple has to offer at the moment, the A6X. It packs two of their custom CPU cores along with four PowerVR SGX554 GPU cores and 1GB of RAM. We've already seen that the custom CPU blows dual-core Cortex-A9s (used in the iPhone 4S, iPad 3 and mini) out of the water and the GPU is the most powerful to be put in a mobile device yet. Geekbench 2 puts the iPad 4 just behind the Samsung Galaxy S III and its quad A9s, but beats the Google Nexus 7. Oddly, the iPad 4 is also ahead of the four Krait cores in the LG Optimus G.
The GLBenchmark 2.5 off-screen test shows a huge performance gap between the new GPU and the ones found in older Apple devices (and the iPad mini). The iPad 4 has a sizable lead on the new Adreno 320 used in the Optimus G too. The on-screen test renders graphics at the native resolution of the display (instead of a fixed 1080p resolution in the off-screen test). Despite having a higher screen res than the other devices used for comparison, the iPad 4 is still on top.